Are you ready for back to school? Check out TpT’s Love Back to School sitewide sale on August 3 & 4! Everything in my store will be 20% off-save an additional 10% off using the code “BTS15” at checkout. Now’s the time to stock up on your favorites from your favorite sellers! Leave feedback for your prior purchases to earn credits you can use on your purchases during the sale. Don’t forget to use the code at checkout! Author Ms. MoonBowPosted on August 2, 2015 August 3, 2015 Categories My Shops, SalesLeave a comment on Are you ready for back to school? The Educents Marketplace is Here! I’m so excited to announce the launch of the Educents Marketplace! 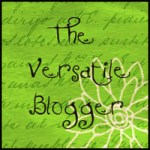 To celebrate the grand opening, my blog-friends and I are hosting a giveaway. Follow the link below to enter for a chance to win $50 in Edubucks to spend in the new Educents Marketplace! Author Ms. MoonBowPosted on April 2, 2015 April 12, 2015 Categories Freebies, Giveaways, Literacy Resources, My ShopsLeave a comment on The Educents Marketplace is Here! It’s been a while since I’ve posted here, but I’ve been super busy with life. 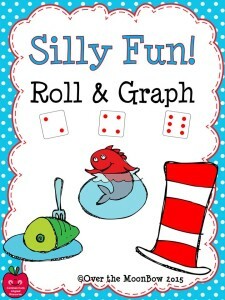 I wanted to let you know that I posted a fun graphing freebie that will compliment activities for Read Across America, and the birthday of our favorite Dr. 🙂 Click on the image below and download your freebie. Thanksgiving Weekend & Cyber Monday Sale! This is an exciting weekend with lots of great sales! 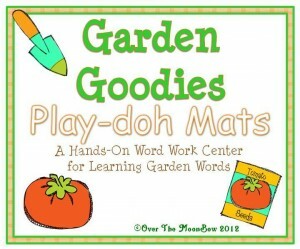 Teachers Notebook is having a Build-a-Bundle event, and three of my products are among the 680 products to choose from. 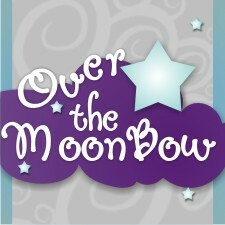 All of the items in my shop, OvertheMoonBow, are 20% off, Saturday Nov. 30th-Monday, Dec. 2nd too! 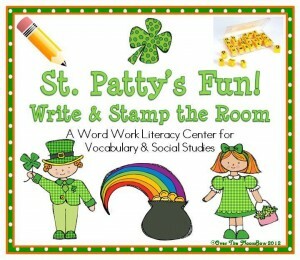 There are many sales & giveaways, including the My Letter to Santa Writing Center giveaway from Over the MoonBow! Hurry, two winners will be chosen on Dec. 1st. And don’t forget about the Cyber Monday Sale at TeachersPayTeachers! 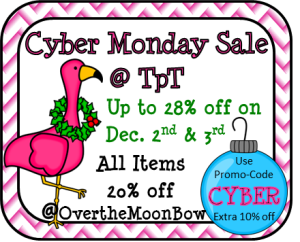 Most stores, including OvertheMoonBow, are having a 20% sale, and TpT is offering an additional 10% off at checkout using the promo-code CYBER. You can save up to 28% on your purchase! Author Ms. MoonBowPosted on November 30, 2013 November 30, 2013 Categories Holiday Fun, My Shops, Sales1 Comment on Thanksgiving Weekend & Cyber Monday Sale! Are you ready for the big event today? 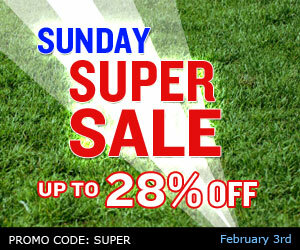 Not the game, it’s TpT’s Sunday Super Sale! Use the code “SUPER” at checkout to receive up to 28% off! All of the items in my shop are 25% off in my shop at Teachers Notebook too! Hurry, both sales end today! 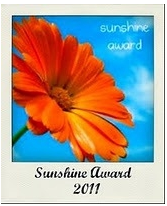 Author Ms. MoonBowPosted on February 3, 2013 February 3, 2013 Categories My Shops, SalesLeave a comment on Super Sale Weekend! It’s been a while since I’ve posted, lots of end of the school year craziness & now my summer’s half over:/ I’ve been busy creating lots of new resources, I’ll be posting about that soon. 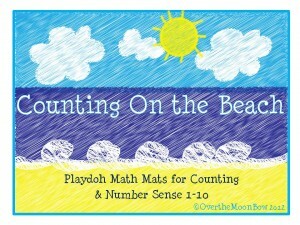 In the meantime, I made a set of play-doh mats for developing number sense from 1-10. 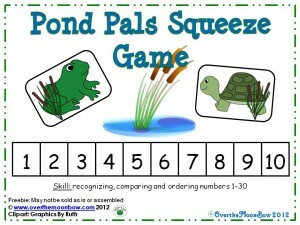 Follow the links below to pick up this freebie in my TpT store or my Teachers Notebook shop. Ok, I know I’m a little late, but hey it’s been a crazy month:) I wanted to show you a few new items I’ve added to my shops for spring, and give you a freebie! and last but not least a freebie! Bunny Friends & a Freebie! 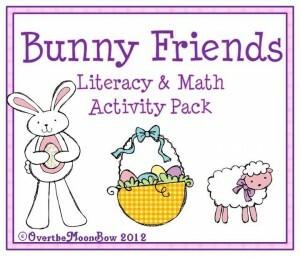 Just in time for spring, my Bunny Friends Literacy & Math 4 Pack features lots of fun & learning for your students. 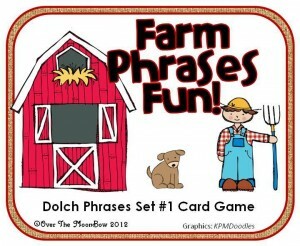 Visit my TpT store or my Teachers Notebook shop to check it out. 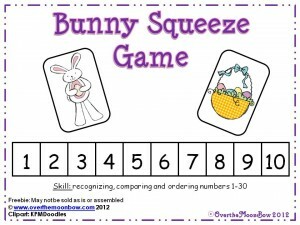 And I couldn’t resist making an adorable number squeeze game with the adorable Bunny Bash clipart from KPMDoodles. 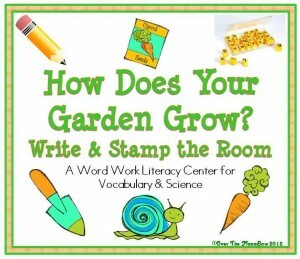 Pick up your freebie in my TpT store or my Teachers Notebook shop. TpT store or Teachers Notebook shop. 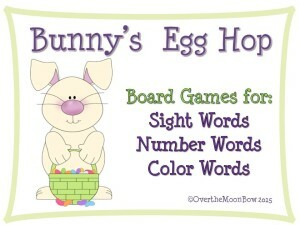 Author Ms. MoonBowPosted on March 25, 2012 March 25, 2012 Categories Freebies, Holiday Fun, Literacy Resources, Math Resources, My Shops1 Comment on Bunny Friends & a Freebie! 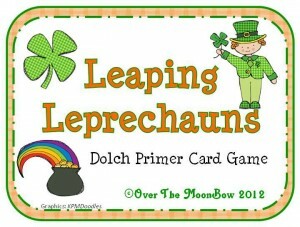 Ok, I admit it-St. Patrick’s Day is one of my favorite holidays. 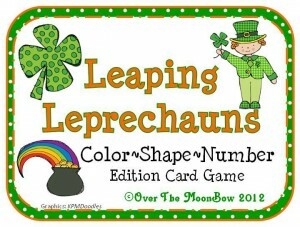 I’m enjoying using my adorable new St. Patty’s Fun clip art from KPM Doodles! Here are a few items I’ve added to my shops at TpT & Teachers Notebook & a Freebie Too!. 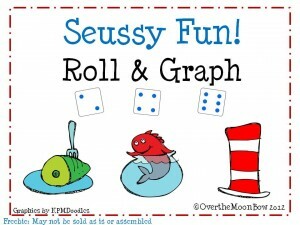 And last but not least, a freebie for you to enjoy with your class. 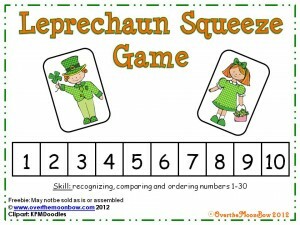 My students love playing number squeeze! 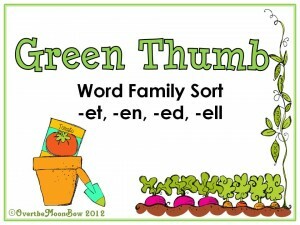 You can download it free in my TpT store or my Teachers Notebook shop. Don’t forget to check out my Leap Year sale, 20% off all the items in my TpT store & Teachers Notebook shop! If you shop on Wednesday, be sure to use the TpT Leap In! sale coupon code at checkout for an additional 10% off – saving you up to 28%. Have a Seussy Fun week!